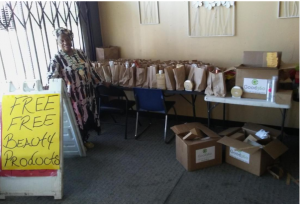 Prison to Peace Outreach, located in San Bernardino, CA, is a nonprofit organization that provides support and encouragement to women facing hardships in the California community. Unfortunately, many of the women that come to the organization have survived abusive relationships, low self-esteem and poor living conditions. This organization helps build the women up within the area to discover their confidence and self-worth after months of hardship. Every year we have a giveaway for the people in the community, and this time women had the chance to pick out any beauty item they wanted. Every year we are touched by the stories and the amount of gratitude we receive. This donation of beauty products was a great way for women to remember that taking care of themselves should always come first and to try to make themselves a priority. There was a lovely young lady named Tomeka, she was so happy to receive this donation due to the quality of the cosmetics in her care package. She went on to explain that she had a job interview the following week, and she was so happy to be able to use the cosmetics when preparing for her interview. Another recipient, an elderly women named Lucille, was brought to tears because she used to wear high-end makeup for many years, but could no longer afford to buy it due to her fixed income. Thank you Good360 for continuing to shine a light on these women and for making them feel special and appreciated!